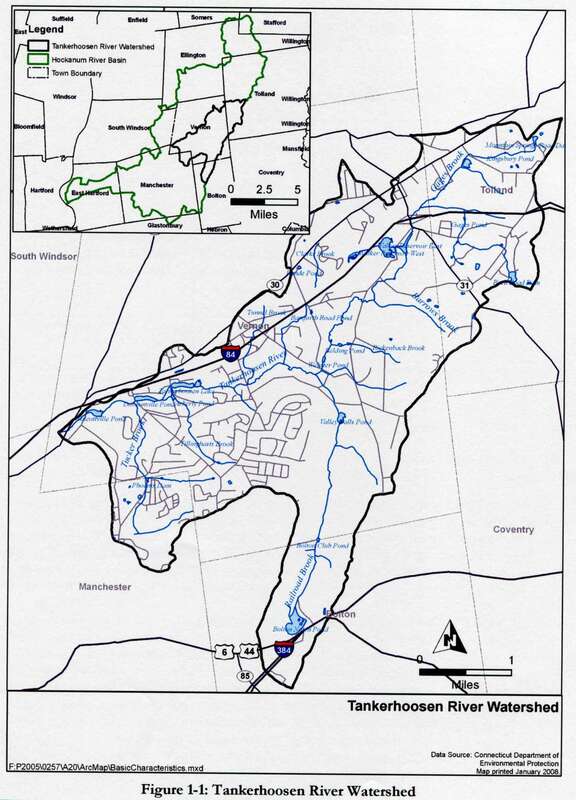 The Tankerhoosen River watershed is a 12.9 square mile drainage basin within the Hockanum River watershed, a major tributary to the Connecticut River. Approximately 70% of the watershed lies within the boundaries of the Town of Vernon. A watershed identifies the area which drains into a river. We prefer to call it a valley but mean the same thing. The Tankerhoosen River technically begins at the base of the Walker Reservoir East dam and flows about five miles until it joins the Hockanum River at Golfland in Talcottville. Land along the upper reaches of the Tankerhoosen River is largely undeveloped and protected open space. Land along the lower reaches is a mix of commercial and residential uses. The west end of the valley begins at Golfland in Talcottville, where the Talcottville River joins the Hockanum River coming from Rockville. The Hockanum then travels through Manchester and East Hartford to join the Connecticut River just north of the Charter Oak Bridge. To get a feel for the length of the valley and watershed drive east on I-84 from Talcottville towards Tolland. You won't see much from the highway but on your right is Talcottville Pond and just before you reach the Dobsonville Road overpass is the Talcottville Gorge. Next you'll pass the Dobsonville Pond and the Tankerhoosen Pond before you pass over the Rails-to-Trails Rockville spur just before the Sacred Heart Church. The area from the Tunnel Road overpass at Exit 66 all the way to Exit 67 is essentially woodland. On your right at Exit 67 you can catch a glimpse of the Walker Reservoirs before climbing the hill into Tolland. This hill drains into the river and is part of the valley. The watershed ends just past the Mountain Spring Road overpass near the top of the hill. That's about a five and a half mile ride giving you a feel for the length of the valley. The northern boundary of the valley is roughly Route 30 from the Vernon Circle area into Tolland. We don't view Route 30 as a ridge line, but it is for much of its journey. To the left water flows north into the Hockanum River and to the right it flows south into the Tankerhoosen River. Early villages and roads were often built along ridge lines and Vernon was no exception. Route 30 is the old Boston Post Road and taverns and mile markers could be found along the way. The eastern boundary of the valley is roughly along Hatch Hill and Bolton Road. Railroad Brook cuts its own narrow valley from Bolton Pond near the notch to Valley Falls before joining the Tankerhoosen at Bread and Milk Road. The southern boundary is harder to easily define. It includes Box Mountain with one edge on Lake Street at the crest of the hill before coming to Risley Reservoir. From there it arcs west picking up a corner of Manchester before cutting across the Elm Hill area of Talcottville to the junction of the river with the Hockanum River at Golfland. At some point we'll outline a route you can drive that will as closely as possible follow the edge of the valley and will encompass the 12.9 square miles.